Nintendo just made a post on the Smash page about an interesting offer. 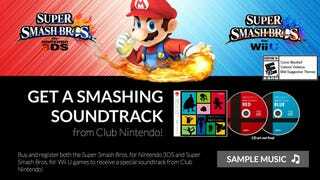 If you register both the Wii U and 3DS versions of the new Super Smash Bros. games, you'll receive a special soundtrack. They even went ahead and offered a few samples of the types of tracks that you can expect. Today has been full of ups and downs in Nintendo news, but this one is way up there in the charts for me—especially since it might be one of the only physical rewards I get from Nintendo this year.